so i officially cut my mana doublers, and put in all my bouncers, i get hated out far less, and it's a lot easier to survive wipe, and spot removal now. Dust Elemental is totally my new favorite card, slightly less efficient than Temur, but WAAAAAAAY more flexible, i dodged sooo many removals in my games with it, and in times of desparation, when i have really nothing to work with DE + Wood Elves/Eternal Witness let me have a mana sink to somewhat advance my board state/protect my stuff, until i had enough lands to win on the spot with zacama. 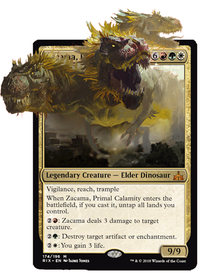 how does Primal Command get Zacama back from thievery effects? bounce the enchantment? what happens when it's not an enchantment effect? Well, first off, let me make the disclaimer that I am an amateur deck builder and have a lot to learn myself when it comes to building decks. 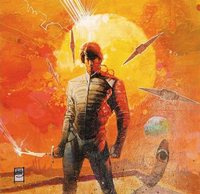 But I can spot quite a few issues with the deck, both from looking it over and playtesting it, and honestly, I don't know if the deck can be made to unsuck without completely revamping it or building a new deck. But I'll give it a shot and offer some advice. First off, I don't know why Armageddon is in there; it doesn't seem to offer any advantage to the deck, and the deck doesn't have any way to build back its own land base more quickly than an average opponent could manage to do. 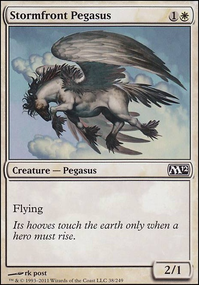 Second, Iroas, God of Victory is fine, if you want to have that in the deck, but there are cards that work against it. The enchantment is nice, but you're not utilizing it to its fullest potential if it's not a creature, which requires devotion, which other cards in this deck work against. Vedalken Orrery, for example, I don't see why the deck needs that; it already has many cards with Flash, and none of the others I can see a need for being able to cast at instant speed. It also doesn't contribute to devotion or field presence. 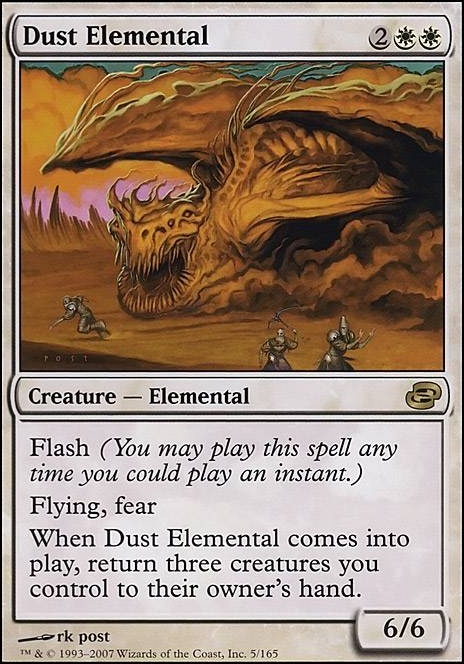 Dust Elemental as well, works against devotion by returning three of your creatures back to your hand, removing both devotion and field presence. And this deck struggles already with acquiring and maintaining field presence. I'd remove both of those cards and look for other white or red cards that pack a little more punch offensively, or noncreature spells that grant trample + power boost, or double strike. The land base is too large. You have no cards in this deck that cost over 4, and even in a normal deck 26 lands is too much, and there's absolutely no way in this deck to thin those lands out of the deck. 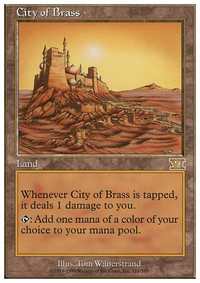 You need some major deck thinning (land fetch), or just cut the amount of lands down. I'd say anywhere from 20-22 lands would be fine, and replace a few of the basics with maybe 2 - 4 Evolving Wilds, an inexpensive way to thin the deck a bit. 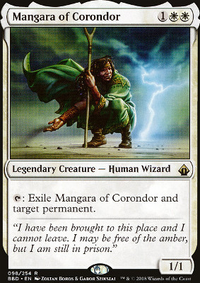 Also, look at your one drop creatures: Anointer of Champions and Boros Recruit. Those are both white creatures, and your only cheap drop creatures, but Sulfur Elemental will immediately destroy both if it ever hits the field, unless you plan on using Anointer of Champions to bolster Boros Recruit until end of turn, and plan on losing the Elemental. But you still also lose the Champion in that. I would say pull some lands out, bring it down to 20-22, add some spells and creatures in to replace those extra lands, and some of the cards that just don't synergize well in the deck, some cheap white or red creatures with haste, maybe a few more powerful creatures at CMC 4, if need be. You could even replace Balduvian Rage with some cards that might be better suited to an early game offensive, with effects like haste and trample. Some good ones I found on a cursory search are Crash Through if you really need Balduvian's draw, or Brute Strength, Built to Smash, Invigorated Rampage, Ride Down, Run Amok, Rush of Adrenaline and Temur Battle Rage are all fairly inexpensive (both in terms of CMC and market price on the cards) spells that will give your creatures a boost, destroy blocking creatures (with regard to Ride Down), and give trample. Not trying to be mean, just trying my best, despite my admitted inexperience, to offer constructive criticism. I feel ya--it can be easy to go off the rails with deck building. You've got some good stuff to work with here, though, so if you don't mind some less-than-expert ideas, I'll throw a bunch of ideas your way. I like your big finishers: Phyrexian Processor, Desolation Twin, the wurms (including Sandwurm Convergence), Giant Adephage, Trostani's Summoner. You're packing pretty much all the Populate spells--that's good. Let's protect that stuff with Heroic Intervention, Eerie Interlude, Cloudshift and--if you can justify the price tag--Teferi's Protection. Hoofprints of the Stag works a little differently from Angelic Accord, but the result is functionally the same. Spawning Grounds is similar to Sandwurm Convergence, but let's you create the token before the end step (but also any end step) which will trigger Accord. Land aura, though, so you have to weigh that. But multiples of your tokens is always better than one, so if doublers are not too hard on your budget, you can't go wrong with those, either. Eerie Interlude and Cloudshift can also be token doublers by giving you multiple ETBs from each Armada Wurm-style creature. If you go this route, Flickerwisp, Whitemane Lion, Jeskai Barricade, Eldrazi Displacer, Dust Elemental, even Roaring Primadox or Invasive Species will all help you get multiple ETBs. 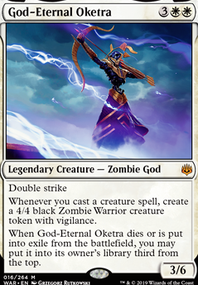 Other creatures that will benefit from this strategy include Hornet Queen, Regal Caracal, and Avenger of Zendikar. I've even used Fiend Hunter to "hide away" one of these (Trostani's Summoner is best) as wrath protection. A couple wraths are good to have despite being a creature strategy: Martial Coup has the benefit of wrathing or not and creating some soldiers, while Phyrexian Rebirth gives you a huge threat that's definitely worth populating. Finally, Garruk's Packleader and Elemental Bond draw you cards for every 3+ power creature that ETBs for you. You can't go wrong with card draw. If you do nothing else, add card draw. This list is very interesting! There are a lot of cards here that I've never seen before. Do you own these cards or is this a list of things you are planning on using? 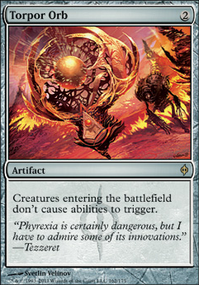 I think it's kind of fragile; especially given the amount of artifact hate in modern. Some one-mana discard would really help to make sure the opponent doesn't Lightning Bolt your Tocatli Honor Guard in response to your Dust Elemental and return your board to your hand. I'd be really afraid of that kind of blowout. What about Ghastly Conscription as a backup? When you put them into play face-down, their ETB abilities don't trigger, and you can turn them face up for their mana cost. I know it's off color, but tell me your opinion on Dubious Challenge. Due to its wording, the opponent's creature enters the battlefield first. So, if you reveal Hushwing Gryff and Leveler, they'll get the Gryff and you get a free 10/10; or they'll get a 10/10 that exiles their library and you get a free win.